Life is filled with daily stresses which keeps people from reaching their full potential of health and happiness. Animals suffer from stress as well. Come learn from Amy Freund, R.N. how to instantly release stress and tension. Experience the calm the body has been begging for with this free technique on Saturday, March 24, 2012 at the South Florida Pet Expo. Learn more at http://www.amyfreundbodytalk.com. People experience so much stress in life that some days seems like a struggle instead of fun. Animals experience worry and anxiety as well, and sometimes lack being in the natural state of joy. Stress is the basis for most of the unhappy, unfulfilled moments in a person's day. Learning how to de-stress the body and face new challenges with a calm balanced bodymind is easy to do. The BodyTalk System is a form of Energy Medicine which teaches individuals how to work with the energy of the body so it can self repair and maintain health and harmony. Within The BodyTalk System, a simple to learn technique called Cortices is the key to helping the brain and body communicate, synchronize and balance which leads to a calm state for self healing. 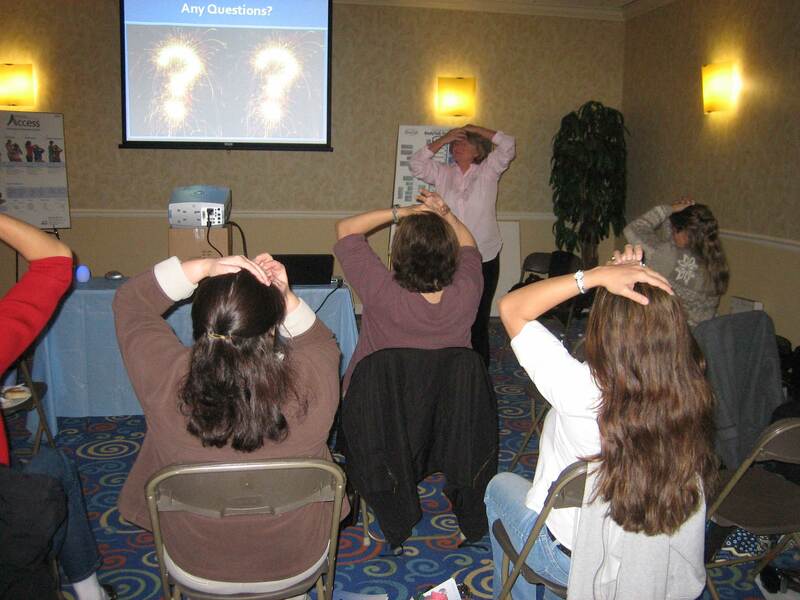 Amy Freund, R.N., Advanced Certified BodyTalk Practitioner and Instructor, will be demonstrating and teaching this Cortices technique for Free at Booth #301 at The South Florida Pet Expo in West Palm Beach, Florida this coming Saturday, March 24, 2012. 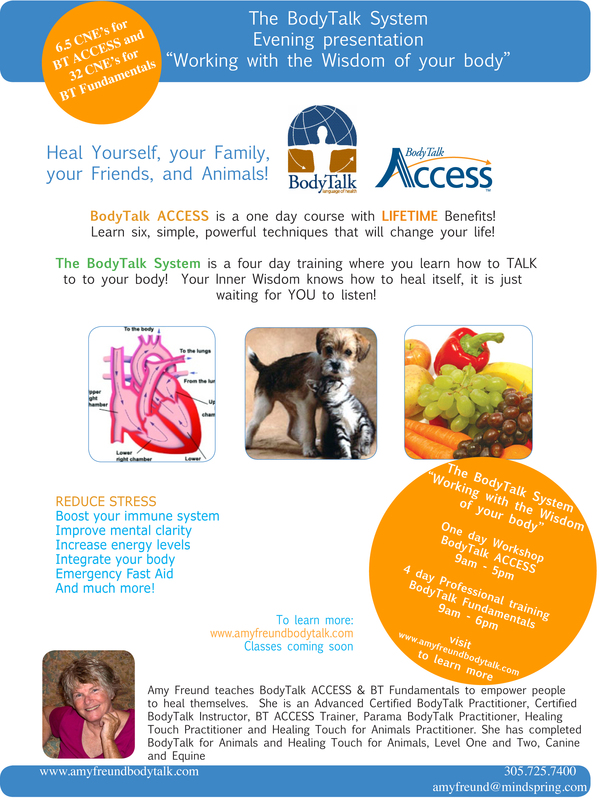 To learn more about The BodyTalk System visit http://www.amyfreundbodytalk.com. Amy has been working with humans and animals utilizing Energy Medicine techniques since 2000. Not only will the application of the Cortices technique be learned for self, family, friends and animal friends, but a Free 4 x 6 postcard with instructions will be handed out so the technique may be practiced at home. The South Florida Pet Expo will be held at the South Florida Expo Center in West Palm Beach, Fla. Over 10,000 people are expected to attend. For more information visit http://www.southfloridapetexpo.com. Amy will be holding two raffles for a Free BodyTalk Session. Sharing Booth #301 will be .GIVE., a business owned by Paisley Dee, which sells hand beaded jewelry items designed and crafted by the Mayan women in Guatemala. Paisley Dee is very involved in assisting charities in Guatemala with several projects. A portion of the proceeds from the jewelry sales will be donated towards these projects. Learn more about .GIVE. at http://www.paisleydee.com. Receive the gift of Cortices and let harmony and balance begin to flow more easily into every day life experiences.